In 2008, Lighthouse Kids received a Preservation Achievement Award. 2000 - 2007: Led by teacher Susan Reynolds, a Community Service group of 7th graders at North Hampton School began efforts to save White Island Lighthouse. This first group raised $400. 2001 - 2002: Helped by Dennis Robinson at www.seacoastnh.com, Lighthouse Kids developed its own web site. Dennis even brainstormed the name, Lighthouse Kids. The group received media recognition in local newspapers, "The Boston Globe" and "Lighthouse Digest." 2002 - 2003: Lighthouse Kids spoke at various local service groups and at the International Lighthouse Convention. Lighthouse Kids officially became a nonprofit chapter of the American Lighthouse Foundation. Features appeared on New England Cable News, "NH Chronicle" and NHPTV. Lighthouse Kids were again featured in several publications, including Yankee Magazine's July/August issue. With the help of State Representative Rogers Johnson, House Bill 274A was introduced to appropriate state funds to save White Island Lighthouse Station. Lighthouse Kids addressed two committees of the NH Legislature. On April 30, 2003 in Washington DC, Senator Judd Gregg presented Lighthouse Kids with a $250,000, "Save Americas' Treasures" matching grant. Jeremy D'Entremont, local historian, writer for "Lighthouse Digest" and keeper of Portsmouth Harbor Lighthouse (keeper@lighthouse.cc), took North Hampton's 7th graders up into Portsmouth Harbor Light. Jeremy also came to school and helped with lighthouse history. Through fundraisers, letter writing campaigns and sincere efforts, at year's end more than $20,000 was in the Lighthouse Kids' account. 2003 - 2004: During this school year, Lighthouse Kids raised more than $57,000. In September the NH Governor and Council approved a Memorandum of Agreement between the State of NH and Lighthouse Kids. Lighthouse Kids started working as partners with the state to raise the funds necessary for this monumental project. In language arts classes, Lighthouse Kids wrote persuasive letters to local businesses soliciting donations. The group also applied for and received grant funds. Lighthouse Kids representatives and engineers met on White Island to begin the design of a landing. Lighthouse Kids worked to get the state to send workers out to stabilize the tower against further erosion before winter. 2004 - 2005: Lighthouse Kids continued its efforts to save the lighthouse station. Kids again wrote persuasive letters in language arts class. Those letters raised more than $2,000. The kids spoke to local Rotarians. With the help of a North Hampton N.H. parent group, Lighthouse Kids began a major fundraiser -- the "LOBSTARS" PROJECT placed art deco lobsters throughout the seacoast region. Lighthouse Kids received $50,000 from the 1772 Foundation. On June 22, 2005 Lighthouse Kids presented NH Governor and Council $110,000. YEAH! The lighthouse tower was repaired and the keeper's cottage received a new roof. The 'Lobstar Project' raised $88,000 for LHK. 2005 - 2006: Through business sponsorship, community support and a fabulous auction at the Seacoast Science Center on September 30, 2005, the Lobstar Project raised $88,000 for the Lighthouse Kids efforts to save White Island Lighthouse Station. Lighthouse Kids received an additional $10,000 from the 1772 Foundation. LHK continue to raise funds through letter writing campaigns and speaking engagements. 2006 - 2007: Lighthouse Kids donate $100,000 to the state of New Hampshire for the construction of a marine railway at White Island. Historically the marine railway existed to provide access to White Island. When the lighthouse became automated in 1986, the manpower to complete repairs disappeared and so did the marine railway. North Hampton School's Letter Writing Campaign raised $3,400. The First Annual Walkathon raised $3,358. Lighthouse Kids received a $1,000 donation from The Fuller Foundation for storm damage repair. The evening of July 28, 2007, "Friends of Lighthouse Kids" sponsored a benefit at Lil Langley's house in North Hampton. 2007 - 2008: Lighthouse Kids chapters were formed at Rye Junior High School and Winnacunnet High School. Pickering Marine of Portsmouth NH constructed a new marine railway. Lighthouse Kids received a $3,500 grant from the Fuller Foundation for program support in local seacoast schools. Lighthouse Kids received a $5,200 grant from New England Lighthouse Lovers (NELL) to replace leaky windows in the keeper's cottage. On May 19th Lighthouse Kids conducted the Second Annual Walkathon. 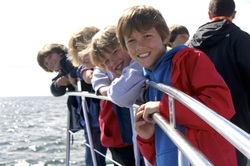 On June 27, "Friends of Lighthouse Kids" sponsored a White Island Lighthouse Cruise aboard The Granite State. On May 13 in Concord NH, at the Annual Awards Ceremony of the New Hampshire Preservation Alliance, Lighthouse Kids received a 2008 Preservation Achievement Award for outstanding education, advocacy and restoration of White Island Lighthouse. 2008-2009: A new chapter of Lighthouse Kids was formed in Hampton at the Academy Junior High School. Lighthouse Kids received a $1,000 donation from the Hampton Rotary for program development in local seacoast schools. Lighthouse Kids held its 3rd annual walkathon, which was once again a success! Most importantly, local mason Jim Leslie recoated the lower portion of the lighthouse tower. Wind, waves and ocean storms deteriorated the 2005 whitewash. This time the white coating was Edison Coating, which has a 10-year warranty. It is the same coating that is presently on Portland Head Light and Pemaquid Point Light in Maine. The white coating is not only beautiful and historic, it's also crucially important because it protects the brickwork from moisture penetration. Footings for a covered walkway between the keeper's cottage and the tower were constructed. The historic covered walkway washed away in the April 2007 ocean storm. New windows were also installed in the keeper's cottage. All windows were replaced, with four windows donated by New England Lighthouse Lovers (NELL). Storm windows were installed over all the new windows. The two chimneys in the keeper's cottage were repaired as well. Friends of Lighthouse Kids sponsored a wine tasting at Jewell Towne Vineyards in South Hampton‚ N.H.
2009-2010: A new chapter of Lighthouse Kids was formed at Rye Elementary School. The chapter at The Academy Junior High School in Hampton is no longer active. In October volunteers went out to replace the rope railing in the tower, paint the outside of the entryway to the keeper's cottage and weed whack the greenery around the cottage. Lots of work has been done, but of course there's still lots left to do! Lighthouse Kids sponsored its 4th Annual Walkathon. Rye Elementary Students Work to Save White Island Lighthouse! On Halloween, Lance, a 2nd-grade student, went trick-or-treating, not for traditional candy but as a Lighthouse Kid. Lance had a very successful evening, raising $183 for the lighthouse project. Great job Lance! as part of 5th grade language arts classes, students wrote fundraising letters to area businesses. Thank you Rye Elementary students and teachers! Throughout her high school career, Winnacunnet senior Carolyn Hooper has been layout editor of LHK newsletters and she has been the student representative to the Board of Directors. Thank you Carolyn! With the leadership of science teacher Mrs. Silver, students have created White Island note cards and magnets to be sold! Thank you WHS students and Mrs. Silver! 2011 – The Annual Walkathon was held on May 16th. Schools participating were Winnacunnet High School, Rye Elementary School and Portsmouth Christian Academy. Also, Adult Friends of Lighthouse Kids sponsored the bi-annual Wine-tasting at Jewel Towne Vineyards in South Hampton New Hampshire. Funds raised were used to ready the keepers’ cottage for stewards by purchasing materials for repairs. Working in an after school program, Winnacunnet High School students made cards and magnets to be sold to the public. Also working in an after school program, Portsmouth Christian Academy students created a video as advertisement for the Golf Ball drop, which took place in June at Sagamore Golf Club’s driving range in North Hampton. Golf balls were numbered by students at Winnacunnet and Rye Elementary schools, then the numbered golf balls were sold. Golf balls were brought up in a helicopter, which hovered over the green while the golf balls were dropped. The golf balls closest to the hole on the green won a cash prize! This was a unique and exciting fundraiser. Lighthouse Kids installed and began ongoing maintenance of a mooring for steward and state use in the cove adjacent to the marine railway. 2012 – Fundraisers: On May 17 the annual Walkathon was held with Rye Elementary and Winnacunnet High School participating. Once again, Hampton Rotary supplied volunteer supervisors for the walk. Also that month, there was a 2-hour narrated cruise fundraiser aboard the motor vessel Granite State to the Isles of Shoals with the focus on White Island. 2013 – Fundraisers: On May 10 the bi-annual winetasting was held at Jewell Towne Vineyards in South Hampton, N.H. On May 17 the annual Walkathon was held at Rye Harbor. Students departing the harbor walked 4 miles south along the coast on Route 1A. Schools participating were Rye Elementary and Winnacunnet High. Stewards served as hosts to visitors on White Island that summer providing guided tours of the facilities and grounds. Stewards continued to cleanup and repair facilities. On rainy days, stewards painted interior windows; in nice weather exterior painting continued. The wood floor at the base of the covered walkway was painted a gloss gray. Building materials abandoned in the cellar were organized. With materials found in the cellar, a new staircase and railing were built for the composting toilet building. One messy task was the removal of deteriorated carpet and padding from the southwest bedroom. This job was particularly challenging because the carpet pad was glued to the wood-planked floor. Each year now, stewards open and close facilities on the island. 2014 – Fundraisers: The 8th annual Walkathon was held on Thursday, May 15. Schools participating were once again Rye Elementary and Winnacunnet High. The bi-annual Isles of Shoals Cruise was held on Friday, June 6, departing Rye Harbor at 6 p.m. on the Motor Vessel Granite State. Thanks to Star Island Corporation, this year’s cruise included a special bonus – a stopover walkabout on the island. Stewards continued to cleanup and repair facilities. Stewards Marg and John Whedon refurbished the wood-planked bedroom floor to a beautiful, lustrous sheen. Additionally, Marg and John removed carpet from the downstairs dining/gathering room. Since this floor had plywood beneath the carpet, a laminate floor was installed. Opening and closing facilities, hosting visitors, mooring maintenance, repairs, weed whacking, painting and litter removal remain ongoing tasks for stewards. 2015 – Fundraisers: This year the format for the Walkathon changed. On June 16, all Rye Elementary School third, fourth and fifth grade students and their teachers participated in a 5K walk through the trails at Odiorne Point State Park. This more than tripled the traditional number of participants. Lunch followed the walk. It was a successful and enjoyable outing for all. The Isles of Shoals Tour with a Star Island walkabout on the Granite State grew so popular that it became an annual event. The 2015 Tour departed Rye Harbor on June 5 at 5:30 p.m. The now well-established Stewards program continued last summer’s model of duties. The Isles of Shoals Sunset Tour with Star Island walkabout on the Granite State is slated for June 3rd at 5:30 p.m.
Lighthouse Kids is a chapter of the American Lighthouse Foundation. If you would like to make a donation to help save the lighthouse, please see our "Donate" page! "Let the Light Live On!"